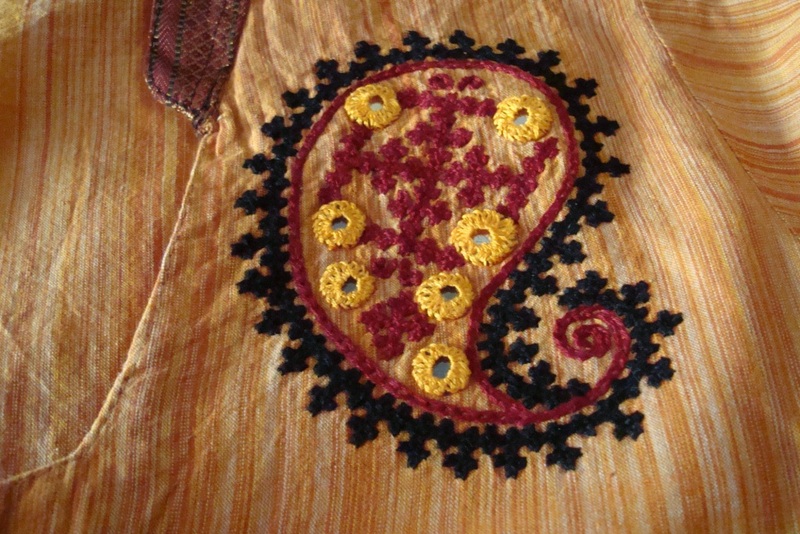 As mentioned earlier, the rest of the yoke is designed as a continuation of the paisley pattern. I drew semi-circles around the buttons, and worked them with mirrors, chain st and kutch work. 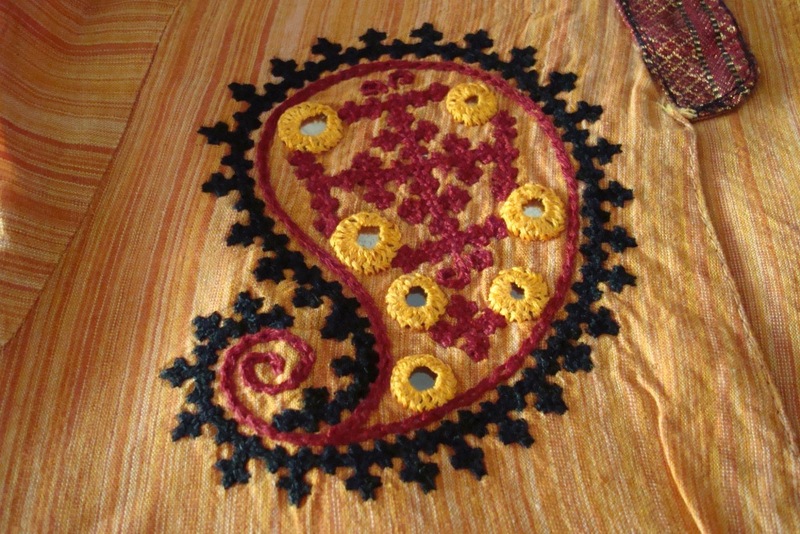 For the central motif, a regular kutch square, with mirrors were worked , around that motif, a chain stitch line and kutch work line , similar to paisley was worked . It was completed with kutch work in semi circle, and a single mirror. I wear a black churidar or black tights for this tunic. I played safe in choosing the colours. This combination always works out fine. Whenever a design is borrowed [ in this case from a book] I tend to go with time tested colours . I don’t know, whether this pattern can be called my own or not. Earlier , I had worked a yoke , fully worked in kutch work in black. 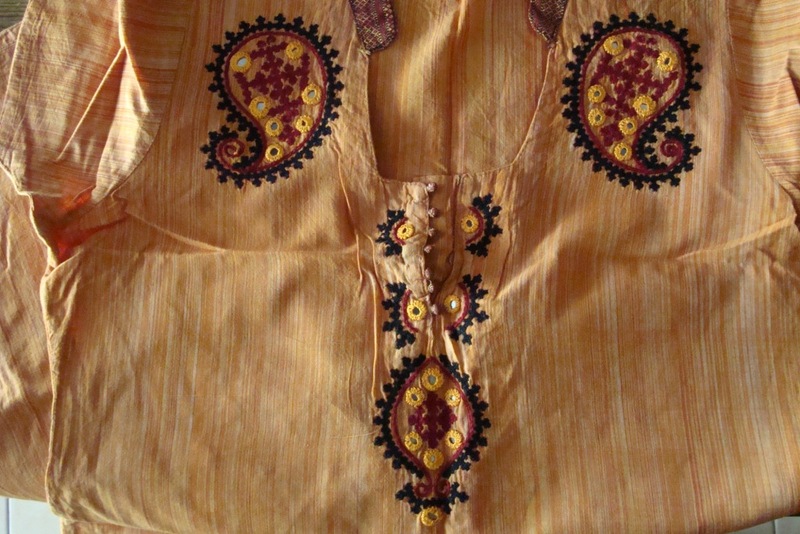 There , the fabric had more orange, this tunic fabric has more yellow. I have a book of embroidery patterns. In that I found a paisley pattern done in kutch work. The pattern included mirror work and outline stitch on it. I have seen small paisley patterns in kutch work, this is a fairly medium size paisley. An apt size for using as a part of yoke design. This yoke design is a mixture of the pattern from the book and my own. For the rest of the yoke design , I followed the paisley design and added a few mirrors, and kutch work motif for the centre. 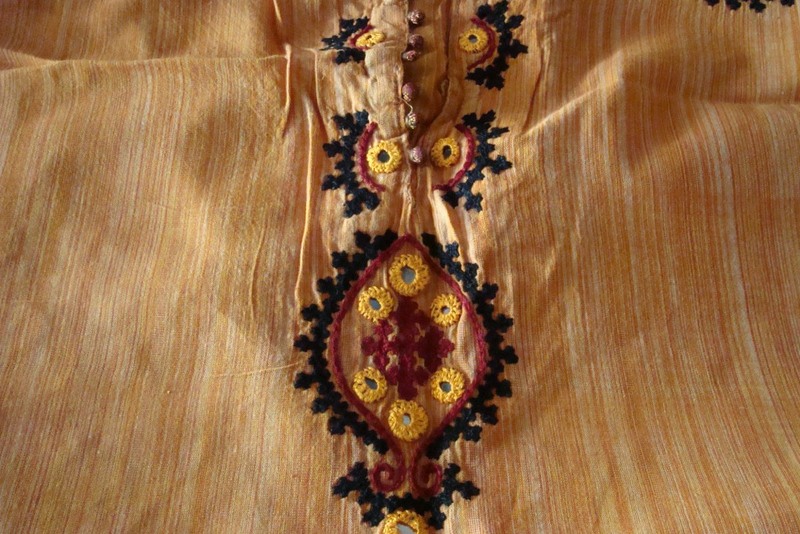 It is a golden yellow colour tunic with stripes. It was already sewn with a small collar in black and red mangalagiri border. I used the black ,red and yellow colour cotton skeins for the embroidery . The full yoke design on my next post.